Tech has no shortage of remarkable students, from app inventors to talented musicians. One Yellow Jacket has a particularly strong claim to fame, though: participating in the 2012 London Olympic Games. Meet freshman swimmer Haibing Iris Wang. Wang’s swimming career prior to her collegiate debut illustrated a brilliant talent in the water. As an athlete, Wang has been well known in China since high school. A gold medal in the 100-meter freestyle at the China City Games in 2011 and a bronze medal the Chinese National Championships in 2012 where she qualified for the 2012 Olympic Games in summer are only the start of her athletic resume. Wang swam the 4×100 freestyle relay at the 2012 Olympics and helped her nation take fourth place, a hair from ascending the iconic podium with her teammates. Just before beginning her collegiate swimming career, Wang even won two golds in the 4×100 relays during the 2013 East Asia Games. On the fast track to a phenomenal career, Wang gained global attention and sparked the interest of Tech women’s swimming coach Courtney Shealy Hart. Hart reflected her belief in Wang by making her one of the women’s swim team’s five recruits for the class of 2019, and the only one who attended high school outside of the state of Georgia. While her background is different from that of her teammates, she shares with them a passion for aquatics. Shealy’s praise of Wang in the aftermath of the latter’s signing was truly effusive. “Iris will be a game changer and catalyst for our women’s team. Her urrent times will make her presence known immediately at the ACC and NCAA level,” she said, per ramblinwreck.com. Making it onto six of Tech’s women’s swimming school records lists and earning a first place spot in three individual freestyle events, Wang’s first season at Tech left fans excited to watch her grow into a conference powerhouse. That hope has certainly been fulfilled thus far. In Dec. 2015, Wang was named ACC Swimming Performer of the Week along with teammate Yuval Safra, who was awarded Male Swimmer of the Week. Wang and Safra earned their ACC accolades after leading their respective teams to wins over Cincinnati and Florida Atlantic. Posting an individual victory in the 100 freestyle and two triumphs in the 200 freestyle and 200 medley relays, earning the respect of competitors and teammates alike while demonstrating that her performance at the London Olympics was far from her peak. Wang ended 2015 a force to be reckoned with. The spring season looks to be an even greater success for Wang. 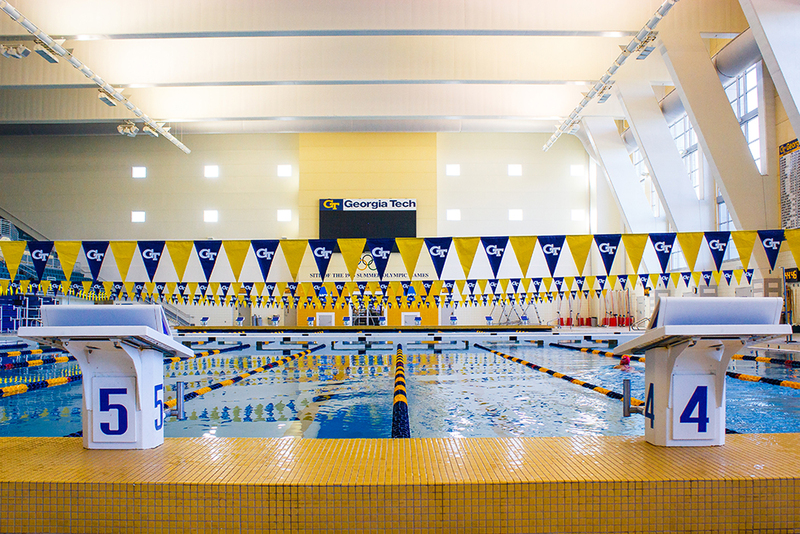 The Jackets will host Duke, Michigan, and Alabama at the McAuley Aquatic Center on Jan. 16. Between the meet tomorrow and the NCAA Swimming and Diving Championships in March, Iris Wang will carry Tech’s hopes. If history is any indicator, the freshman swimmer is more than suited for the role; in fact, she is well-prepared to assume it.